There are many opportunities to go hunting that do not require hunters to submit an application for a hunt permit-tag via the Draw. Referred to as over-the-counter tags, these permits are available for purchase from department offices and in many cases from license dealers. 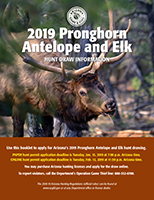 Species and hunts available are: archery-only deer (some unit restrictions); limited opportunity elk; mountain lion; bear; archery-only javelina and juniors-only turkey (shotgun only). Hunters must also download the Elk Informational Handout (below) for additional information on boundary descriptions, maps of hunting areas, season dates, frequently asked questions, and more. Hunters are encouraged to keep this supplement and the regulations with them when hunting. 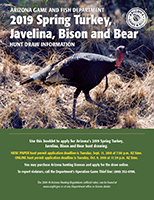 Hunters must also download the Javelina Informational Handout (below) for additional information on boundary descriptions, maps of hunting areas, season dates, frequently asked questions, and more. Hunters are encouraged to keep this supplement and the regulations with them when hunting.